So anyone else riding cranks this old? They're triples but have been SS for 8 or more years. I dig these cranks but I'm starting to think I should replace them. Thoughts on what to go with? My thinking too. I've just been outta the loop so long on bike parts, that I'm not sure what's out there or what's changed. I do like the simplicity of the square taper (never had a rounded off BB) and these have been bomb proof. DOH! Circa....I knew I was typing it wrong but in a hurry at work. Middleburn rs7 square taper cranks with a SKF BB should be set and forget for a good decade or so. All of my "modern" bottom bracket systems require more maintenance and don't spin as well as my "obsolete" square tapers. Also my modern crank-arms tend to have weird bolt patterns that require special chainrings. The newer systems are lighter, but not necessarily better on the whole. It depends on what your priorities are for this bike. The money may be better spent elsewhere. Old well-used gear has soul... use it until it fails. I wouldn't replace them until they are no longer useful. I had some '98 XTR cranks that had one of the crankarms crack. Then I had to make the decision for a cheaper 4-bolt, or a more expensive 5-bolt. I went with the 4-bolt, but I miss those cranks... If you replace these broken or not, you'll miss them. Have a browse through chumbox's dyslexicly titled "Post your up cranks". If they were cheap worn out cranks...I would vote to replace. But they were quality then, and are quality now. Keep them. I rocked those for years. Only reason I switched to 960s was the Turbines hit the stay on my N9. This is what I've been using for the last six years but I don't think that the SKF bottom brackets are available any more. Quality stuff though. I just bought another SKF BB two weeks ago. They are only available through compass bicycles now. In the USofA, unfortunately. I'll find somewhere in Europe that has them if I look a bit harder, I suppose. It looks like they ship international. I have RF Turbines on on my 2 SS bikes (square taper), as well as on my geared fully (ISIS). I have no plans to replace them. Light and stiff. Can't ask for better. 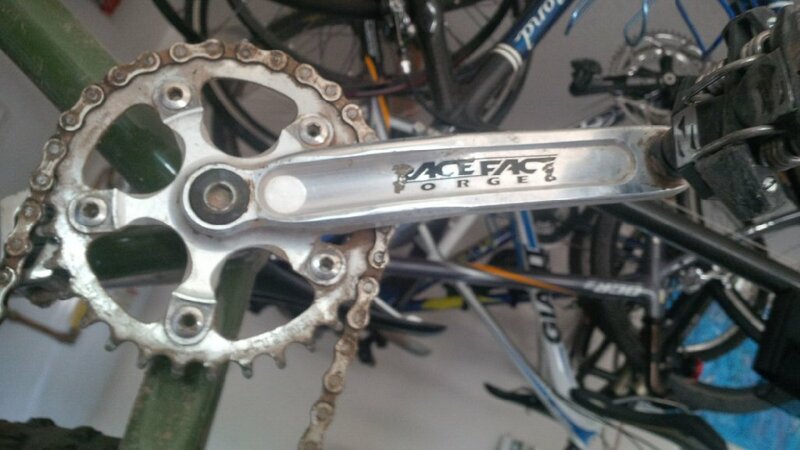 2011 Raceface Turbines are here!